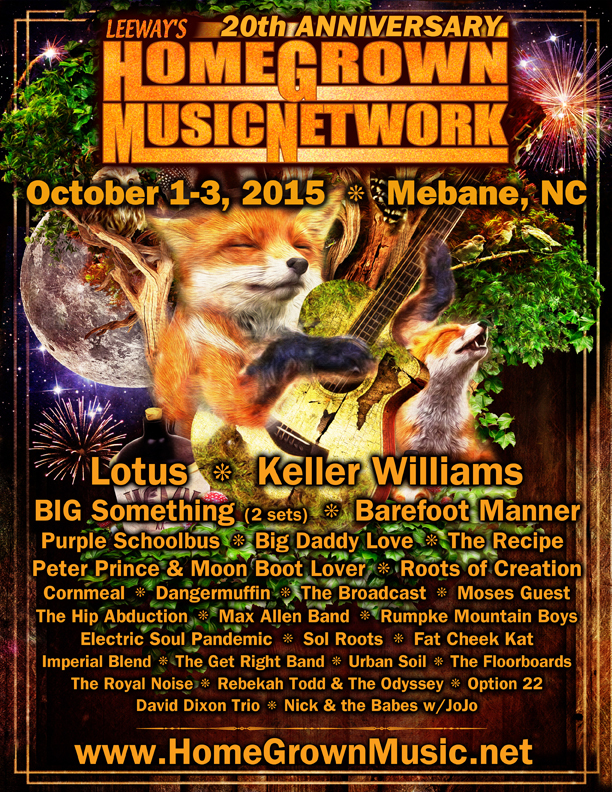 UPDATE: The schedule for Home Grown Music Network’s 20th Anniversary Festival is altered due to Hurricane Joaquin. Tickets will be fully refunded, and tickets for the new schedule of events can be purchased separately. HGMN is also accepting donations for the canceled event. For more information, visit https://homegrownmusic.net/. This coming weekend Leeway’s Home Grown Music Network will celebrate of 20 years in the business with a monster festival on the stomping grounds of Mebane, North Carolina. Leeway’s Home Grown Music Network is a collective group of independent jam bands, venues, fans and businesses that strive to work together to help the independent music scene thrive. Founded by North Carolina’s own Lee Crumpton, Leeway’s Home Grown Music Network has been fighting to support independent live acts for two full decades, helping bring such incredible talent as Perpetual Groove, Umphrey’s Mcgee, STS9, and countless others, to light. Crumpton has been involved with the music scene since an early age. As soon as he got his driver’s license he started to DJ at a local radio station and night club, and as he began to meet more musicians in the industry he saw a need to help connect musicians with fans. Having this goal in mind, Leeway’s Home Grown Music Network was born. Reaching twenty years of doing anything is always a cause for celebration. For Home Grown Music Network there is no better way to do so than with a music festival. Held on a beautiful 300+ acre farm between Greensboro and Durham that also happens to be home to The Big What? Festival, this amazing venue is complete with two stages, hot private outdoor showers, and even a giant mustache see-saw. Headliners include local jam band juggernauts Big Something, the incredible one-man show Keller Williams, and Lotus, a front runner of the jamtronica scene. Raleigh locals Barefoot Manner, recently off of hiatus, will be bringing their unique blend of funky newgrass to the stage. Prior to their break, Barefoot Manner played with acts such as Sam Bush, Acoustic Syndicate and Larry Keel, and opened up for The Dead. Chicago bluegrass act Cornmeal will play Saturday, coming off of their newly released album Slow Street, which hit shelves this May. Recorded with guest appearances like Anders Beck from Greensky Bluegrass on the dobro, Slow Street was their first studio album since 2006. With this new music in their repertoire, Cornmeal is sure to light up the stage. Peter Prince, complete with his band Moon Boot Lover, which includes members of Soulive, will also be bringing the heat with their brand of funky soul rock. Peter Prince has shared the stage with many of the biggest names in the jam scene including Derek Trucks Band, Page McConnell, Steve Kimock, and many more. With so many big names recognizing the power of Prince’s music, this is sure to be a highlight of the weekend. Asheville’s own The Broadcast will also be gracing the stage this festival, bringing some classic 70’s rock sounds mixed with their own modern take. This only scratches the surface of the great music that will appear on these stages in Mebane this weekend. Rain or shine, it will be a wonderful weekend of memories celebrating an organization that has helped culminate bands we all know and love. Visit their website for tickets and more information.